There, I said it. Coprophagia, or poop eating as it is commonly called, is a gross, disgusting, and relatively common behavior. It is especially common in puppies: I know because my puppy was a poop eater. I think it all started because she was in a new environment with an abundance of poop. There are three dogs in our household so there are lots of opportunities for it. There are a lot of theories about why dogs display this behavior. Sometimes the poop tastes really yummy due to undigested food or flavorings in it. It could be a displacement activity; the puppy feels stress and feels better when it eats something or puts something in their mouth and poop is readily available. It could be an allelomimetic behavior, the dog sees you picking up poop and mimics you the best she can. Some female dogs eat their puppies poop and the puppies mimic that behavior. There are so many theories and reasons that it would be hard to list them all. 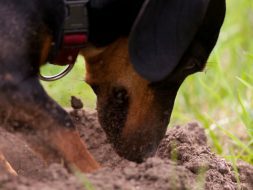 If your dog is a poop eater, the single best thing you can do to prevent and get rid of that behavior is to keep your puppy’s environment clean and poop free. Try to pick up your puppy’s feces when they can’t see you pick it up. You don’t want your pup to pick up poop too. If your dog eats their own poop, try a more digestible or sensitive stomach diet. Sometimes dog’s digestive system will do well with one food and not so well with another. Undigested food in the poop can still be yummy to your pup. Exercise lowers stress in dogs so increasing the amount of vigorous exercise can help if the dog is eating poop as a displacement activity to lower stress. Try to make sure the exercise is something that you do with your dog, not something you expect your dog to do on his own. Try to keep the environment clean and stimulating for your dog. If there isn’t any poop to eat, then they may try to find something else to occupy their time. Try making an area to dig in and bury some of their toys in that area. Ultimately, the very best way to stop poop eating is to limit access to the poop by cleaning up after them every time they have eliminated.